Add a touch of country rustic charm to your home or office with this wooden square wastebasket. Standing 12 inches tall with a tapered design, this waste bin is perfect for use in the home, office, bathroom or bedroom. A whitewash finish gives this bin a rustic weathered appearance. Each corner has been adorned with decorative spade shaped metal brackets for an added flair of elegance. Its durable wood construction and natural textures make it ideal for indoor or covered patio use. 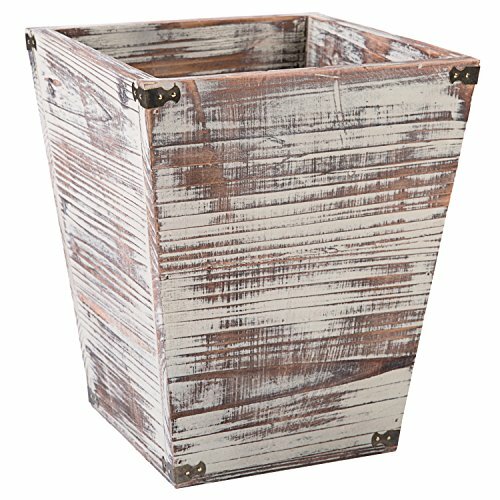 Approximate Dimensions (in inches): 12.0 H X 9.75 W X 9.75 D.
Rustic style square wastebasket with torched whitewash finish. Features tapered design and decorative spade style metal brackets on each corner. Perfect waste bin for tossing stuff away in your home, office, bathroom or bedroom. Approximate Dimensions (in inches): 12. x 9.75 W x 9.75 D.